Argentina has launched a new 50-peso currency note featuring a map of the Falkland Islands to commemorate the 32nd anniversary of the invasion of the British archipelago. 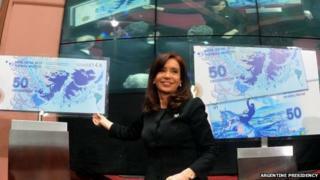 President Cristina Fernandez de Kirchner said the Falklands were "Nato's military base" in the region. British troops regained control of the archipelago after a 74-day war in which more than 900 people died. Argentina claims sovereignty of the islands it calls Las Malvinas. The new note is worth just under $7 (£4). On one side, it displays a map of the islands in the white and blue colours of the Argentine flag. "We live in a changing world. I have endless confidence that we will recover these islands," Ms Fernandez said during a ceremony at the Casa Rosada presidential palace. "The colonial enclaves always end up being recovered, sooner or later," she added. Ms Fernandez said that Britain had installed long-range missiles on the island, which represented a potential threat to South America. "The British government does not reveal what the military budget is for the Falklands. That is a pity in a country where 20% of the young people are unemployed. "It would be good if England was less dedicated to war and more to its own people," said Ms Fernandez. She also renewed calls for Britain to join negotiations on the future of the Falklands. But UK Prime Minister David Cameron has said that there would be "no negotiation" over the islands' sovereignty. In March 2013, residents in the Falkland Islands voted overwhelmingly in a referendum in favour of remaining British. Just three residents out of 1,517 were against remaining British. Mr Cameron said the vote in favour of staying a British overseas territory was the "clearest possible result". Argentine forces invaded the Falkland Islands on 2 April 1982 but surrendered after just over two months of fighting. A total 255 British and about 650 Argentine servicemen were killed in the fighting, along with three Falkland civilians.